Sweet as sugar…but bitter as bitter gourd too! The monthly recurring revenue (MRR) is the most critical metric SaaS businesses need to keep an eye on for survival. It helps you to improve constantly and depict a true potential of your business. MRR definiton, MRR calulations, MRR forumula, MRR tool…everything important related to monthly recurring revenue you should know is covered here. What is MRR / What is Monthly Recurring Revenue? Monthly Recurring Revenue or MRR is a normalized earning per month from all active subscriptions. In other words, MRR is the recurring income a company can anticipate every month. Normalize means to find the accurate MRR value after taking into account various components, pricing plans and time intervals. These components make it difficult to calculate the accurate MRR. We will discuss all the components in depth as we move ahead. But before that, let’s just try to calculate monthly recurring revenue without any components attached to it. Assume, you have 100 customers, each paying you $50 per month. Super simple and straightforward. Isn’t it? But wait. It’s not that simple the way it looks. It all changes when components come into the picture which changes your MRR to a great extent. Why Monthly Recurring Revenue is preferred over Monthly Revenue? Let’s say you have a customer on your annual plan A priced at $1500 and 10 customers on monthly plan B which is priced at $100. So your 1st month revenue will be (1*1500)+(10*100) = $2500. But for the 2nd month, your monthly revenue will only be from monthly plan B customers $1000 (10*100) as you have already received money from the customer on plan A. This gives an impression that your revenue is going down. But that’s highly mistaken. It is stable because you are still serving the same number of customers. Only thing, you got the revenue in advance. Because unlike monthly revenue, MRR will be calculated as (1500/12) + (10*100) = $1125 every month. You will arrive at the accurate MRR only after considering the components. Majority of the SaaS businesses have multiple pricing plans at different time periods (monthly/quarterly/yearly). Therefore, initially, all the customers will get divided into these specific plans and their payment recurrence will depend on the plans they chose. Secondly, due to promotional offers, customer loyalty programs, unsuccessful customer retention, free trials, refunds and cancellations, the MRR gets affected. And you would be happy to know that this is the stage where calculating accurate MRR becomes more difficult and dangerous. (Don’t worry, there’s a solution that handles these complexities well). Without any further delay, let’s take all direct components and understand them with examples. Let us assume your MRR for 1st June 2018 is $10000 from 100 active customers paying $100/month. Your three pricing plans are $75/month, $100/month and $150/month. You also offer annual plans of $750, $1000 and $1500. Now, let’s see, what will be your MRR after 30 days due to the behavior of these same 100 customers and a few more. This is a simple addition method. Calculate MRR for each component respectively and add all the values. This makes calculations more easier and confusion-free. Let’s analyze each table component now. A satisfied customer is always loyal and interested in advancing his thirst for more features. In this scenario, you realize 15 out of your current 100 subscriptions have upgraded their $100 monthly plan to $150 monthly plan. If we had overlooked the upgrades, our calculation could have horribly impacted the overall MRR and it would have been a disaster on a business front. Downgrades signify that your business may have failed in retaining the customer at a higher plan. Or, the customer may feel satisfied with the lower plan. 5 out of 100 subscriptions downgraded their monthly plan from $100 to $75. Now, if we had continued taking $100 for these 5 subscriptions, your MRR would have come as $500 which isn’t correct. Apart from downgrades, another negative impact on MRR is cancellation of subscriptions. Here, you need not pay customer anything back from the next billing cycle but the customer will stop paying you. So, if 5 customers canceled their $100 monthly plan, from next month you will not take $500 (5×100) into the MRR calculations. It will be counted as 0. These are the remaining active subscriptions who neither upgrade, downgrade, cancel or refund. They stick to their current plan. So MRR from these active subscriptions will be 75*100 = $7500. If we had not considered the discount, the MRR could have come as $2000 (20×100) and it would have impacted the net MRR. These are also new customers who joined this month but without availing any discount. Let’s assume you got 12 new customers at $100 monthly plan. So the MRR from these new customers will be $1200. Let’s assume you got 3 new customers at $1500 annual plan. So the MRR from these new customers will be (1500/12*3) = $375. We normalized the annual plan on monthly basis. So, for the next 12 months, we’ll add $125 every month for each of these three customers. Free trials should not be taken under active subscriptions. Their number will only be taken into MRR calculations when they become paid subscribers and hence, they must be excluded from MRR. So, your final MRR comes to $13400from 130 active subscriptions. Now, this MRR we calculated was after 30 days. But, due to complex behaviour of customers – switch-over, churn; the MRR gets affected frequentlty or daily and hence method 2 explained below is the standard approach to calculate MRR. In this method, we first consider the current MRR from all active subscriptions ($10000 in our case), add the additional revenue from new customers acquired and upsells; then subtract downgrades and canceled subscriptions amount to get the final MRR. New customers contribute directly to MRR growth. In the above example, 12 new customers purchase $100 monthly plan, 3 new customers purchased a $1500 annual plan and 20 new customers took the discounted plan. So the sum of all these three is ‘New MRR’. The revenue earned through upselling will contribute to an increased MRR. In our case, 15 customers upgraded their plan from $100 to $150. The revenue from these upsells is called as’Expansion MRR’. If some of your customers cancel their subscription in the current month or downgrade their subscription, the sum of revenue lost from them is called ‘Churned MRR’. In our example, 5 customers canceled their $100 monthly plan, 5 customers downgraded to $75 plan from $100 plan. Either approach, the final MRR comes the same. Note – Refunds are not reflected in MRR. But refunds are shown separately and its effects will be reflected in your total revenue. Putler will put an end to all your worries about MRR calculations and help you understand your business better. Putler automatically takes care of all the above-mentioned MRR components and the tedious calculations. 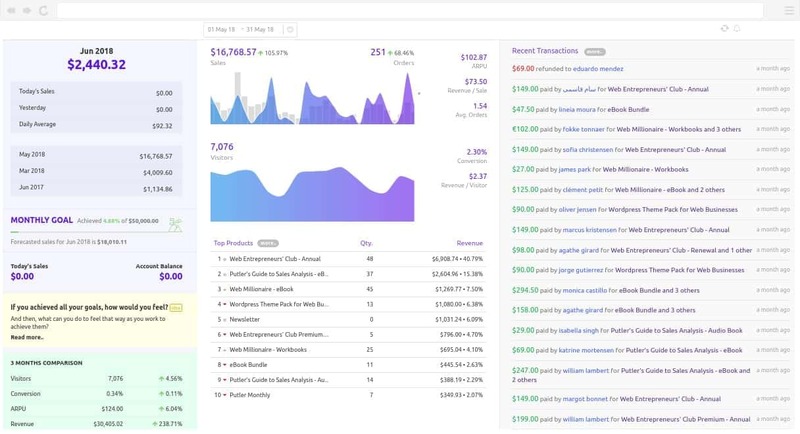 No matter how much complexities and pricing plans are associated with your business, Putler will handle all and present accurate MRR in a neat dashboard. If you have entered late, Putler is the preferred analytics solution for thousands of e-commerce businesses to track and grow their business. 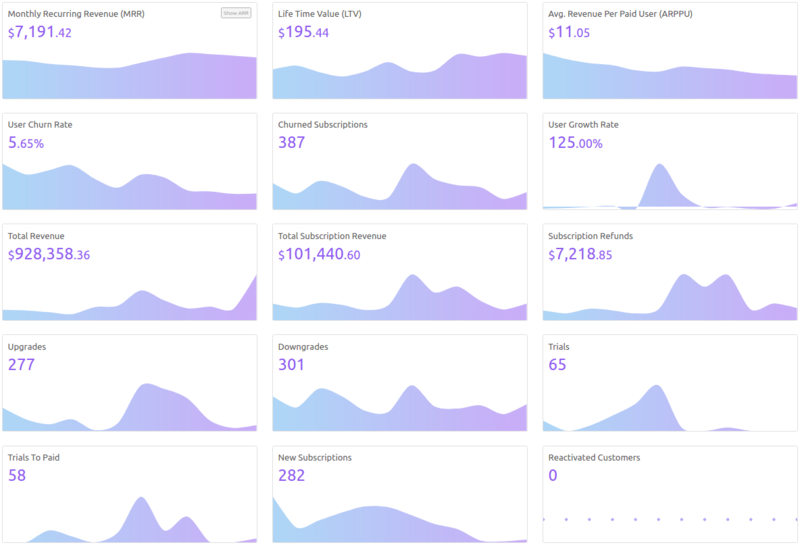 Not just MRR, Putler shows 15 subscription metrics like Lifetime Value, Average Revenue Paid Per User (ARPPU), Annual Run Rate (ARR), user churn rate, user growth rate, and other 110+ e-commerce metrics which can help you in strategic growth. There are some MRR tools that handles upgrades, downgrades properly but not coupons. Now, if these issues are not sorted, it impacts your true MRR to a great extent and shows a different picture completely. But if you are using Putler, you need not worry about it. Enough has been discussed so far about various components of MRR calculation and its effects, now we certainly know that it is important for SaaS business to know their true MRR. We will now summarise the importance of MRR. To forecast – Knowing an exact MRR helps the business to forecast future sales month by month. To plan a budget – Like monthly recurring revenue, there are certain recurring expenses in every business, especially marketing and sales expenses. Knowing your MRR can help you create a solid budget for the upcoming months. To boost the sales team – For any reason, if your MRR is showing a downward trend each month, you can incentivize your sales team to close more deals. It will not only boost their confidence but also increase MRR. Now let’s try to figure out how to improve MRR. Every business constantly needs to check the customer lifetime value (CLV) to know if they are targeting the right audience and if their product meets the market demand or not? Increased customer retention rate would help in upselling/upgrading the existing customers and hence it will increase MRR. Sales and marketing team must work together to refine the product message which targets a specific group and not all sorts of audience. It must be customized and target specific which can help in generating more revenue. Customer acquisition cost is not taken in the MRR calculation but it indirectly helps you optimize your business. If you try to reduce the customer acquisition cost, you can use those savings in expanding your business which will inherently increase your revenue. Are you monitoring accurate MRR? Taking decision based on improper MRR will land your business into unexpected and risky situations which can prove fatal. Hence, it’s important to get the right MRR which is essential to grow and make better business decisions. And to have that MRR value without any efforts, you have Putler at your disposal.